Apples of Gold presents a white gold cross pendant that is a true tribute to the Lord with its beautiful style. The brilliance of 14K white gold is used to bring a sleek profile to this cross pendant. The cross pendant ends each arm with a crown-like detailing. This element of elegance makes a regal piece out of an otherwise simple cross. The tapered body of the cross brings added depth to this exquisite piece, only from Apples of Gold. 34.5mm x 23.5mm (1 5/16" x 15/16"). 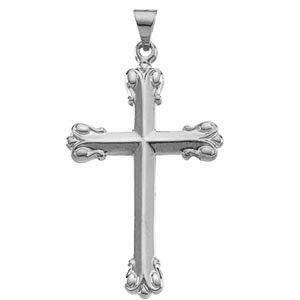 We guarantee our Ornate Cross Pendant, 14K White Gold to be high quality, authentic jewelry, as described above.